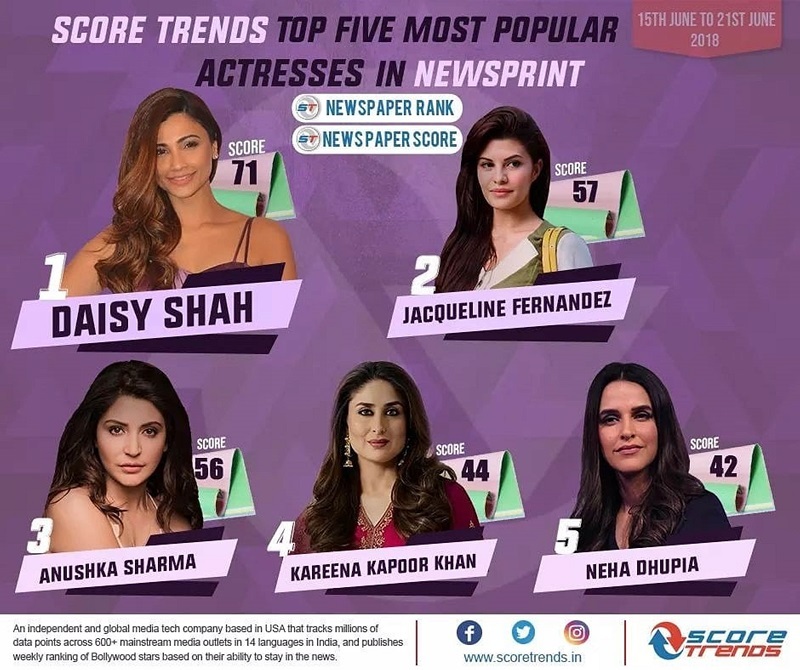 Daisy Shah tops the ScoreTrends India as the most popular actress in Newsprint surpasses Jacqueline ! Daisy has also done phenomenally well on the ‘Leaderboard’ of ScoreTrends by reaching top 5 on the charts ( check graphics). Daisy’s popularity post Race 3 has amplified especially with the most talked about dialogue of the film ” My business is my business” which got popular then any Salman Khan’s dialogues in the film . Daisy tops the Score Trends Newsprint chart with 71 points while Jacqueline is on the second position with 57 points followed by Anushka Sharma, Kareena Kapoor Khan & Neha Dhupia on third fourth and fifth rank. Previous articlePrassthanam director Deva Katta to direct Baahubali Prequel! Next articleIts a wrap for Jeetu Joseph’s film ‘Body’s’ shoot!